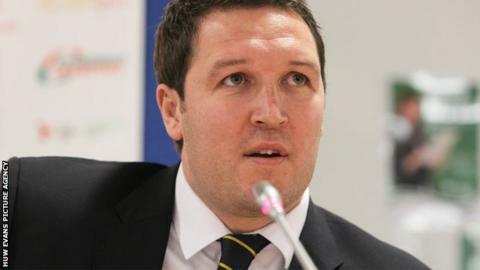 Port Talbot Town director of football Scott Young has been sacked. The former Cardiff City defender replaced Mark Jones as manager of the Welsh Premier League side in December 2012. The club failed to secure a place in the league's top six and are currently ninth in the table. "This decision was not taken lightly, but the board feel it is in the best interests of the club moving forwards," said chief executive Andrew Edwards. "The board would like to place on record their thanks to Scott for his efforts this season and wish him every success in the future." The club have yet to announce who will take charge of the team for the rest of the season. Young and assistant Marc Cahill issues a statement that read: "Whilst results on the field early season were not what we would have hoped for, we are able to look back with great satisfaction on the undoubted progress made during our time at the Genquip. "It has been widely publicised that the club faces a number of off-field issues at this time and I sincerely hope that these can be rectified so that my successor is able to take Port Talbot Town FC forward without constraints, whilst Marc and I look forward to our next challenge."